Does This Trick Ring a Bell? 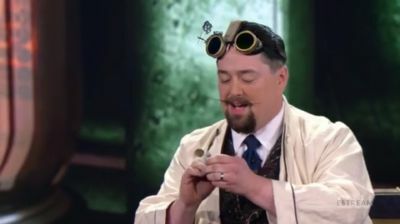 Aspiring magicians are invited to perform their best trick to try and fool the world-famous team of Penn & Teller, who will get to see the trick only once and have to immediately try to work it out. Anyone who succeeds wins the right to perform with Penn & Teller in their celebrated show at the Rio Hotel & Casino in Las Vegas. The live studio audience and the TV audience watch along with Penn & Teller as they try to figure out the secrets. The magicians featured in the episode include Dyno Staats, Aiden Sinclair, Axel Adler and David Parr. Alyson Hannigan ("How I Met Your Mother") serves as host.